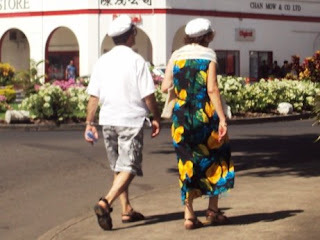 As with any former imperial colony, Samoa has a small population of people with non-native ancestry that are easily discernable from those whose peoples have lived here much longer. There are a fair amount of expatriated Kiwis and Aussies, some Germans. There are the Japanese JICA volunteers, the Peace Corps, and a bunch of Australian volunteers. And while I’m by no means familiar with every individual living on the island, Apia is a small enough community everyone gets to be pretty familiar with everyone else’s habits and routines. So when the palagi population quadruples or quintuples and takes the town area by storm, it’s noticeable. 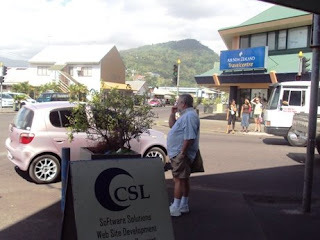 I’m told Samoa’s tourism industry is growing by leaps and bounds. With the relatively recent construction of the sea wall, the renovation of the tourism authority building, and increased foreign public relations campaigns, Apia is becoming an increasingly popular cruise ship port in the South Pacific. By my unscientific estimate, when the Navy’s not here, there’s about one cruise ship here per week. The ships roll in before dawn and typically set sail around 10 or 11 p.m. I live close enough to the harbour I can hear the ship blow its horn on its way out. The implications of a sudden onset of a large mass of tourists reach far and wide. Those who benefit most would seem to be the flea market vendors who ride a micro-sized wave of inflation from the influx of customers and cash. Most sellers have never been to a day of business school, but the laws of supply and demand are not lost on them. I would think the business would be good for taxi drivers too. On mornings when there’s a boat in town, you can see the parade of taxis heading toward the wharf to pick up the breakfast-buffet-fed seafarers. But I’ve talked to taxi drivers on days when there’s a cruise ship in town, and the consensus seems to be that with so many taxis, it becomes a feeding frenzy, and the increase in business is negligible. I am curious about where people go when they get off the ship. I figure there must be a sizeable portion of the boat that heads to the other side of the island where there are more beaches. But from what I can tell, a lot of them take a cab into town and aimlessly mill around for a couple hours. There was a boat in town this past Saturday, and I was killing time in town waiting for Blakey. It was a good time to people-watch. I saw an elderly couple walk into Eveni Carruthers, the store that specializes in school uniforms for most of the local primaries and colleges; not typical tourist fare. Other than that, tourists flock to what’s familiar to them: McDonald’s, the Internet café, and the place in town locals refer to as Palagi Alley. I rode my bike to Cale and Sara’s on Saturday morning, so when I rolled back into town, I had yet to go near the sea wall. But the McDonald’s intersection had crowds of white people on all 4 corners waiting to cross the street. Gotta be a ship in town, I thought to myself. And sure enough, there it was. It’s weird being a local palagi during a cruise ship visit. On one hand it’s a little easier to fade into the crowd (although Peace Corps tend to be more tan, more dirty, and more smelly than the average tourist). On the other hand, we work hard to assimilate into the culture here, and getting lumped back in with random palagis can be slightly demoralizing. So I like to speak as much Samoan as possible on cruise ship days. It helps. Boat tourists. Perhaps the captain? And maybe Tenille? 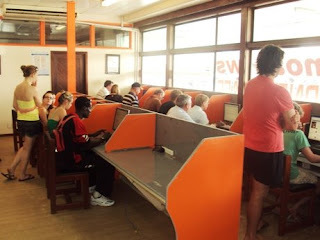 Boat tourists at the Internet café. 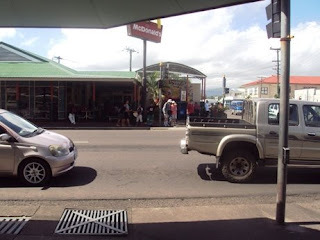 McDonald's intersection with crowd on corner. More of McDonald's intersection with more palagis on other corners. 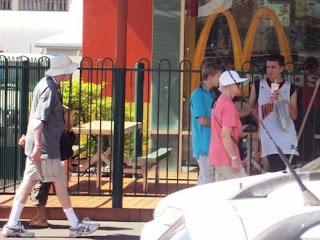 Boat tourist kid wearing Warriors jersey in front of McDonald's. "Don't worry about it, your country can cure swine flu and tourist dollars can cure your country's economy"
ha ha they should teach this stuff at business school. 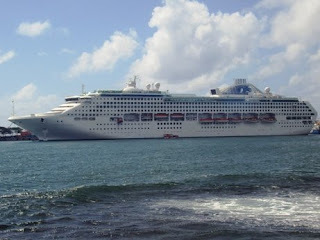 When the cruise ships are in town I get a little offended if people ask if I'm from the ship! I feel palagi enough already. I read your heading as Cultural Exploitation at first and thought that would have not been such a bad concept. I think we all have to talk far more about the impact of cruising on local lifestyle, use of scarce resources and employment choices.